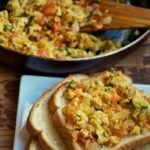 I could survive on Egg Bhurji and could eat it for pretty much every single meal of my life without getting bored. 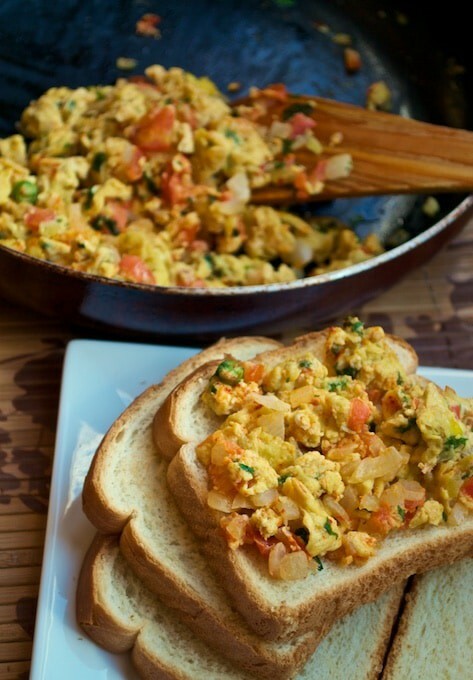 Unfortunately, we don’t make Egg Bhurji so often at home (more like once or twice in the 10 years we have been married) because my husband is still scarred from eating Egg Bhurji every single day that he lived in a hostel while studying for his engineering. Once kids came along, they preferred Scrambled eggs over Egg Bhurji, and this dish got sidelined even further until I made a solo trip to Mumbai and my mother-in-law’s neighbor – Mrs Shinde was kind enough to offer this tired and weary traveller some home-made Rotis and hot Egg Bhurji. That made me realized how much I missed it! Once back home, I decided to introduce my kids to this dish and while my younger one was disappointed that it was not the scrambled eggs she loved, the older one totally devoured it! Now, I know who got my genes ;-). Anyways, Egg Bhurji makes a great breakfast and I love the fact that you can’t go wrong with this and you know what, if your omelette breaks while you’re flipping it, turn it into a Bhurji recipe – no one will know ;-). Heat oil in a pan kept on medium heat. Add onions and saute for 3-4 minutes, until they soften. Add tomatoes and fry them for another 3-4 minutes. Lower the heat to medium-low and add the remaining ingredients - eggs, chilli, chilli powder, salt and coriander leaves and gently stir the mixture. In about a minute, increase the heat and scramble the mixture to break down the clumps to the size you desire. Continue cooking till the eggs are done.